Metis Gilera rider Marco Simoncelli seized the lead in the 250GP world championship with a dominant win today in a rain-hit Sachsenring GP. Starting from pole and gambling on running a new spec factory Gilera RSA that he’d only briefly tested in Brno recently, Simoncelli eased to victory after early resistance from Spaniard Julian Simon. Despite a good start from Simoncelli, Simon took the lead briefly before dropping back to second, giving Simoncelli the advantage again. Simon briefly took the lead before a nerve-wracking rear tyre slide saw him lose ground and Simoncelli siezed the opportunity to pass him on the outside. With 27 laps still to go, Lotus Aprilia rider Alex Debon lost the front on the wet track and crashed out of the race. Less than a lap later, Spaniard Hector Barbera passed Simon to take second, but at the front of the race Simoncelli started to hammer home his advantage and pull away with a growing 2 second gap. Seven laps later, Kallio moved up to second place, putting Barbera back into third. Barbera was struggling in the tough conditions and Kallio instantly started to pull away from the Spaniard. 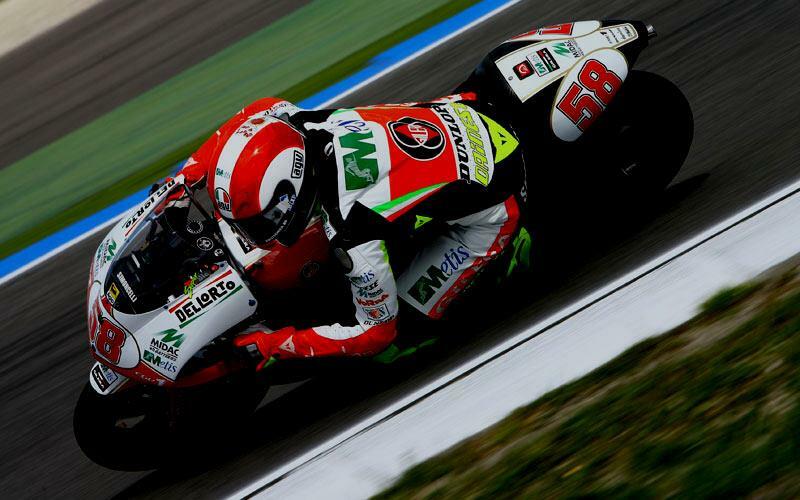 Meanwhile Simoncelli was in imperious form at the front the race as he held a massive six second lead. With 13 laps to go, Red Bull KTM 250 rider Aoyama suffered a highside while up at the front, Simoncelli increased the gap to 7.4 seconds. Marco Simoncelli kept up a fantastic pace throughout the race to win for a third time in 2008, and in the process he opened up an 11-point lead on KTM rival Mika Kallio. Hector Barbera kept the pressure on Kallio and eventually passed him to finish in second place. Alvaro Bautista finished on the podium in third, with Kallio having to settle for fourth.